Organic Poultry Products – Are They the Real Deal? The demand for organic poultry products will continue to grow, despite the fact that producing organic chicken is expensive both in monitory and environmental terms. All organic systems are by definition free-range systems as well. Free-range systems are more difficult to manage than conventional farms. In true organic production systems, disease control, nutrition and processing are complicated by the fact that only organic products may be used in their execution. All of these aspects make organic production difficult, labour intensive and expensive both in monitory and environmental terms, meaning that we will need to receive considerable premiums for organic products if we are to produce them cost effectively. From the consumers point of view there are food safety and ethical issues. Consumer need to know that the products that they are buying are safe, nutritious, and tasty. More importantly, they need to be assured that if the label says “organic” they are indeed buying organic products. Producers and retailers need to act in an ethical manner in this regard. In both the USA and in Europe organic poultry products are tightly regulated. For example, in the USA, the Organic Foods Production Act was promulgated in 1990. It provides a clear definition of what constitutes organic food and what production, processing, and handling requirements are mandated. Both production and processing facilities are subjected to third- party audits for compliance with every aspect of the organic plan annually. The USDA organic seal can be used only on organic foods whose production systems have been inspected and approved by third-party certifying agencies and who comply with the regulatory requirements. More recently, the USDA established the National Organic Program (NOP) in 2002, thus formalising organic poultry production. Organic livestock husbandry practices focus on living conditions that permit natural behaviours and provide outdoor access, preventive health management with a prohibition of antibiotics or other drugs (although vaccines can be used), and organic feed. Organic feed must be produced without using synthetic fertilizers and pesticides; pastures to which birds have access must also be organic. Hatcheries are currently not required to be organic, and conventional chicks may be used if they are under organic management by the second day after hatching. In the egg industry there has been a movement away from cages. They are to become illegal in Europe and it is proposed that they should be banned in the US state of California. Anderson et al., (2009) point out that in the case of laying hens that the concept of natural and organic production systems have been expanded to include cage-free and free-range production and that the two have become integrally linked. In the remainder of this article we will look at the various aspects of the poultry value chain with regards the way in which organic practices impact upon it. Housing should protect birds from the elements, maintain a comfortable temperature, provide ventilation and clean bedding, and allow birds to exercise and conduct natural behaviours. Cages are not permitted. In addition, the birds must have access to the outdoors for exercise areas, fresh air, and sunlight and must be able to scratch and dust bathe. The American NOP does not specify indoor or outdoor stocking densities for broiler, but certifying agencies look for a low stocking density, at least 7 – 8 birds per m2. There is no limit on the number of birds that can be raised in a flock under the NOP; in contrast, European Union organic regulations limit the size of flocks. Most organic poultry production in the United States is produced under intensive, large-scale conditions similar to those in the conventional industry. Although birds must have access to the outdoors, often outdoor access is limited. Poultry may be temporarily confined for inclement weather, the stage of production, conditions under which the health, safety, or well-being of the animal could be jeopardised, or conditions that pose a risk to soil or water quality. Therefore, in many operations, the exits (pop holes) remain closed during much of the production cycle. Bird behavior under free range management systems is of interest. It has been found that birds kept in small groups are more likely to spend time outside than bird in large groups (32% of the birds in a 500 bird flock versus around 5% in a flock of over 16000). Birds are most likely to go outside if the temperature is between 10 and 20°C, and about half the birds remained within 8 meters of the house when they do go outside. The NOP emphasizes that no drugs, AGP‟s, or synthetic parasiticides are permitted, although natural materials can be used. Antibiotics and other medical treatments must not be withheld if they are needed, but birds treated with prohibited materials should be diverted to non- organic markets. Proactive health management is important in organic poultry production. Producers should reduce stress and maintain the bird‟s immune system. The introduction of disease should be prevented with the use of vaccines and biosecurity practices. Probiotics and prebiotics are often used in organic poultry production, particularly to replace antibiotic growth promoters (AGP), which are not permitted. The theory is that by encouraging the establishment of a population of beneficial gut micro flora, will lead to reduced colonisation by pathogenic organisms. Work carried out in many parts of the world would indicate that these nutraceuticals may not be as effective as we would like them to be, which ultimately leads to less efficient poultry production. Emeria). This is at odds with the general belief that the birds are less stressed and at this stage it cannot be fully explained. All feed used in organic poultry production must be organic, including pasture the birds range on. This makes organic feed expensive. Data published by the USDA in 2003, shows that there is adequate certified organic acreage to produce the ingredients required to by the organic poultry industry. However, the report ends with the remarkable statement that “price of organic rations should not exceed double the price of conventional feeds”. Only roasted, extruded, or expelled soybeans may be used. Ingredients that have been defatted with chemical solvents are not permitted. Slaughter by-products, antibiotics, and feed from genetically modified organisms (GMO) are not allowed in organic feed. Feed may contain natural, non-agricultural feed additives and supplements or there may be approved synthetic substances that are allowed by the NOP National List, which basically allows minerals and vitamins and not much else. In the UK, the organic content of organic feed was mandated to increase from 90 to 95% in January 2010. However, synthetic methionine will be permitted until October 2010. This will be problematic for nutritionists as it is difficult to formulate adequate diets without DL Methionine. The consequence is that crude protein levels of the diets increase – which in turn gives rise to wet litter and its associated problems like NE. In a presentation at the European Poultry Nutrition Conference (2009), Dr K Elwinger from Sweden demonstrated (by way of photographs) the health risk to layers of using methionine free (synthetic) diets in organic egg production. He was able to conclude that a dietary methionine shortfall is a potential risk in organic production, impairs plumage condition and results in decreased egg weight. One can‟t help but wonder what sort of an impact it will have on the birds‟ immune system. Feed supplements, such as fishmeal, enzymes, and oyster shell, are permitted in larger amounts to improve the nutrient balance. The fishmeal does not have to be organic because it is a natural substance used as a feed supplement. Prohibited substances such as ethoxyquin may not be added, which precludes most commercially available fishmeal from us in organic diets. Some companies market their poultry products as not having been fed animal products and therefore may not use fishmeal. If truly organic feed is supplied to poultry, the only realistic way in which to achieve some normality in the feed formulation used is to use at least some fish meal. Although alternative, slow-growing genotypes are used in organic production in the European Union, conventional genetics are currently used in the United States. The slower growing genotypes used in Europe are less efficient than conventional broilers in terms of yield, but have better liveability. In theory, there are differences in meat quality between conventional and organic chickens. Conventional birds are generally young, very tender and juicy, but with a less intense flavour. Meat flavour has been shown to increase with age, probably because of an increased concentration of nucleotides in the muscle. Thus the slower growing genotypes, which are older when slaughtered, tend to have more flavour. However, Brown (2008) and his co-workers evaluated meat quality and sensory characteristics of chickens reared using standard, maize- fed, free-range or organic production systems. The standard system used Ross or Cobb birds with a slaughter age of about 40 d, the other systems in the trial used slow growing Hubbard birds (especially bred for free-range production) with considerably older slaughter ages (72 d in the case of organic systems). There were significant differences between rearing systems, with fillet muscles from birds grown under the standard system having a higher ultimate pH. Differences were also seen in colour with fillets from birds reared under a standard system having a smaller hue angle than those grown using the maize-fed system which had the highest (remember most birds in Southern Africa are fed on diets rich in yellow maize). Fillets from birds reared in the standard system were rated by the taste panel as more tender and juicy. There were no significant differences in chicken flavour. Based on hedonic assessments of flavour liking and overall liking, by a small panel of assessors, meat from birds produced in the standard system was most preferred and that from organic systems the least preferred. Meat from free-range and maize-fed systems was intermediate in preference. Williams (2009) calculated the environmental burdens of broiler and egg production using an environmental life cycle assessment model. Burdens are quantified by primary energy and resource use on the one hand, and the potential for causing environmental harm, including global warming, eutrophication and acidification on the other. When looking at the burdens of poultry production, lifetime feed consumption needs to be considered. This would include any feed and energy consumed by the breeders, but these overheads are relatively small. The burdens of meat production are higher than egg production. The more extensive the production system is, the higher the burden will be. In broad terms, the more technically efficient a system is, the lower will be its burdens. The results generated by Dr William‟s model appear in table 1. Table 1: Environmental burdens of poultry production (after Williams, 2009). As can be seen, Alternative production systems in poultry place a higher burden on the environment (apart from pesticide usage) than conventional systems. In broilers, the carbon footprint of organic production is 50% higher than conventional systems. Broiler production has developed to be the most resource-efficient meat production system in agriculture. Despite the fact that the direct burdens of controlled environmental housing are higher than other systems, the overall burden is lower. For housed birds, direct energy use is considerable and there must be scope for new generations of systems that are less reliant on fossil fuel. Because the outdoor chickens tend to „hang around‟ the house, the area immediately surrounding it is likely to become polluted with Nitrogen and Phosphorus. Dutch research has shown that the mineral load 20m from a free range house exceeded the maximum allowable levels for fertilizer application, i.e. 170 kg of N and 44 kg of P per hectare. In addition, the birds are in danger of picking up parasites and disease in the ranging area. The difficulty is that it is not practical to effectively clean or disinfect a field so the problem may become worse with succeeding flocks. Wilson (2009) examined nutritional practices and environmental impact under different production systems. Excessive nitrogen and phosphorus excretion can be influenced by many factors however diet selection (specifications) and ingredient selection will have the greatest effect. Should specific ingredients be required for diets (for example, organic ingredients), which are only available in limited quantities in a few locations, their use will lead to an increase in the carbon footprint associated with their use and an adverse environmental impact. In broad terms he was able to demonstrate that birds raised under alternative production systems were less efficient (Table 2). 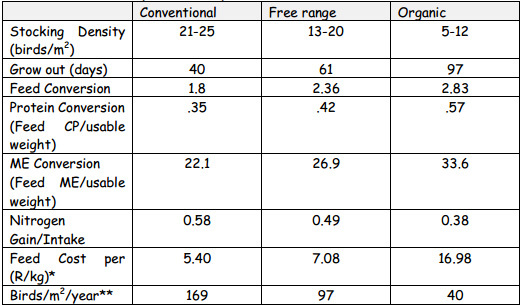 Table 2: Comparison of farm performance, nutrient utilisation and total nutrient excretion for three different production systems ( after Kratz et al., 2004). I have calculated some costs, and yield figure on these data. Bearing in mind that “organic feed should not cost more than twice what conventional feed costs”, it can be seen that it costs 3 times as much per kg to feed organic birds, and only a quarter of the number of birds are available for sale. It would seem that the only way to produce organic chickens and make a return equivalent to conventional systems would be to sell the meat for 4 times the price of conventional birds, or rely on state subsidies. Both meat and eggs must be processed in a manner that is certified to be organic. Important points include the use of approved organic detergents, sanitizers and pest control methods and the prevention co-mingling with non-organic products. Organic and all-natural foods have become an alternative in most mainstream retail food outlets. One of the principal beliefs is that organic foods are safer than conventional foods. Many consumers base this belief in the safety of organic foods on the prohibition of pesticides and chemicals in raising the organic food. However, their understanding of the risks from pathogenic microorganisms on organic foods is not clear. In some recently conducted research (Griggs, 2007), it was found that raising chickens without anti-biotics, especially when the birds are kept outdoors, can result in higher levels of Campylobacter and Salmonella contamination of the meat than in conventionally raised chickens. It is also well established that we are more likely to pick up a Salmonella infection from eating free-range eggs than conventionally eggs. A number of issues have prompted me to examine the way in which alternative (organic) products are marketed in South Africa. Firstly, the Bryanston Organic market in Sandton (probably the largest organic market in the country) has decided that the standards for organic production are too stringent, so they are going to introduce their own, watered down version (Farmers Weekly). Secondly, Woolworths who have pioneered the “alternative” market, are about to embark on what they call the “Farming for the Future” program. It is, and I quote “to be a combination of organic farming principles, and the best modern science has to offer” – in essence, it will be their own version of Organic Lite. Lastly, my local butcher insists on trying to sell me organic chicken, and I know full well that there are no truly organic broilers produced in this country. The reality is that the rest of the world has stringent sets of regulations for a product to qualify as “Organic”. In South Africa, we feel that we are entitled to move the goal posts as it suits us, and simply create our own set of standards. Even more disturbing is the fact that anyone can call their product “Organic” and put it on a shelf without any fear of recourse. ← Koi Food – Look Beyond the Label!